January began with an amazing full super moon named the Full Wolf Moon after howling hungry wolves and has plans on delivering another one at months end. Additionally, the first Blue Moon total eclipse in 150 years is on January 31st. In 2018 we have two Blue Moons (January and March) because there are 13 full moons – plus a February with no full moon. During this period of illuminance take the opportunity to reexamine and recalibrate your goals and aspirations. Let go of what is not working and move forward with what brings you joy. 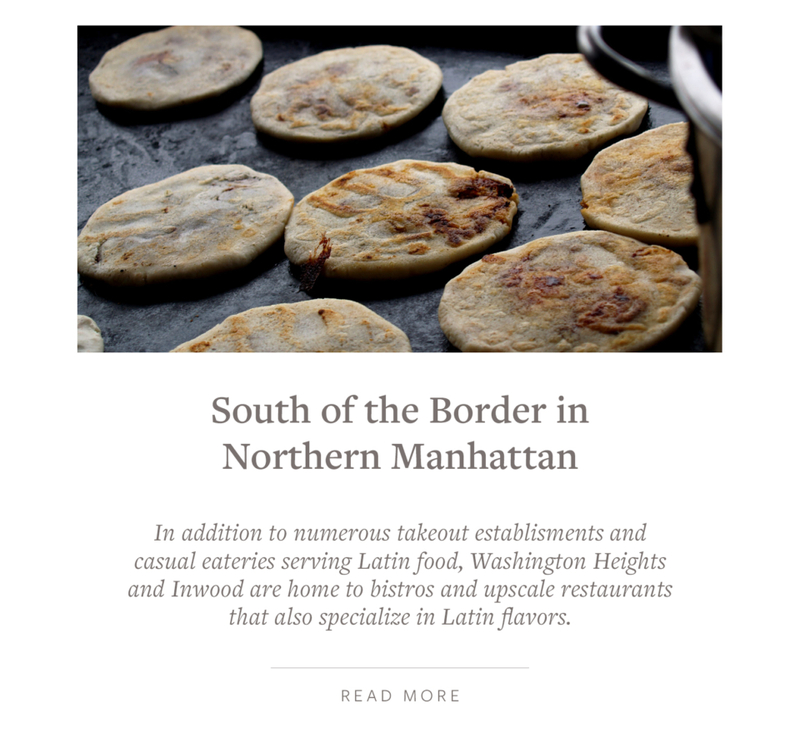 This month’s Culturally Inclined focuses on Washington Heights and Inwood introducing South of the border eateries, specialty culinary shops, the Audubon Mural Project displaying over-sized paintings of American birds, a bounty of parks including the last remaining forest in Manhattan (A new one-acre park called Muscota March opened in 2014, Inwood Hill Park, Baker Field a waterfront park, Isham Park, Sherman Creek Park (Swindler Cove), Fort Washington Park, Fort Tryon Park and Highbridge Park), musical performances in Landmarked buildings and other unique spots, the Jumel Terrace historic district consisting of 50 row-houses built between 1890 and 1902, and other notably historic sites. 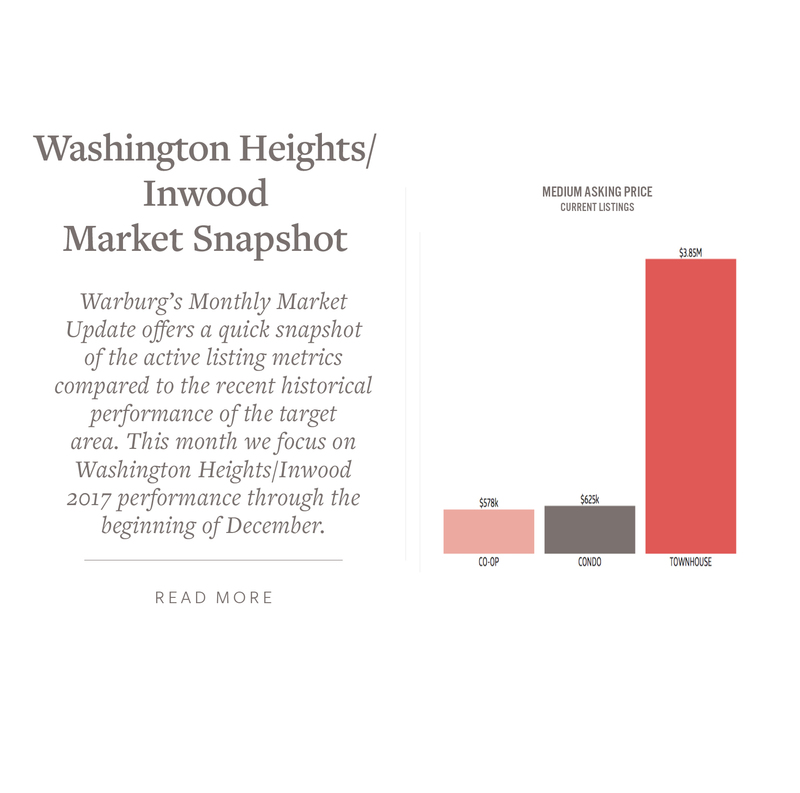 Washington Heights is bounded to the south by 155th Street and to the north by Fairview Avenue and runs from the Harlem River on the east to the Hudson River on the west. 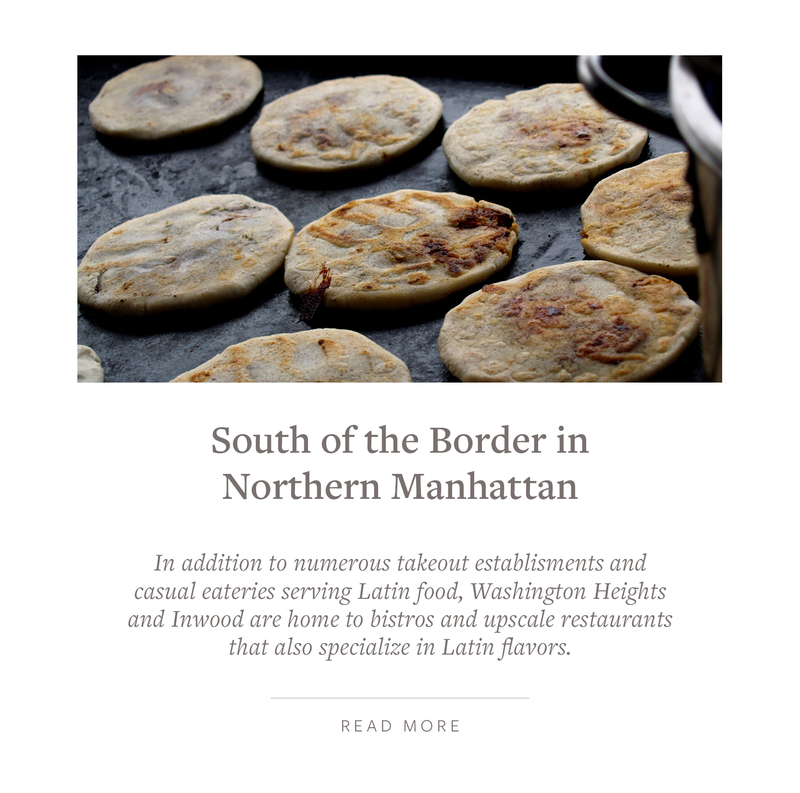 Inwood is the northern tip of the island, everything lying north of Fairview Avenue. The two neighborhoods make up Manhattan Community District 12. 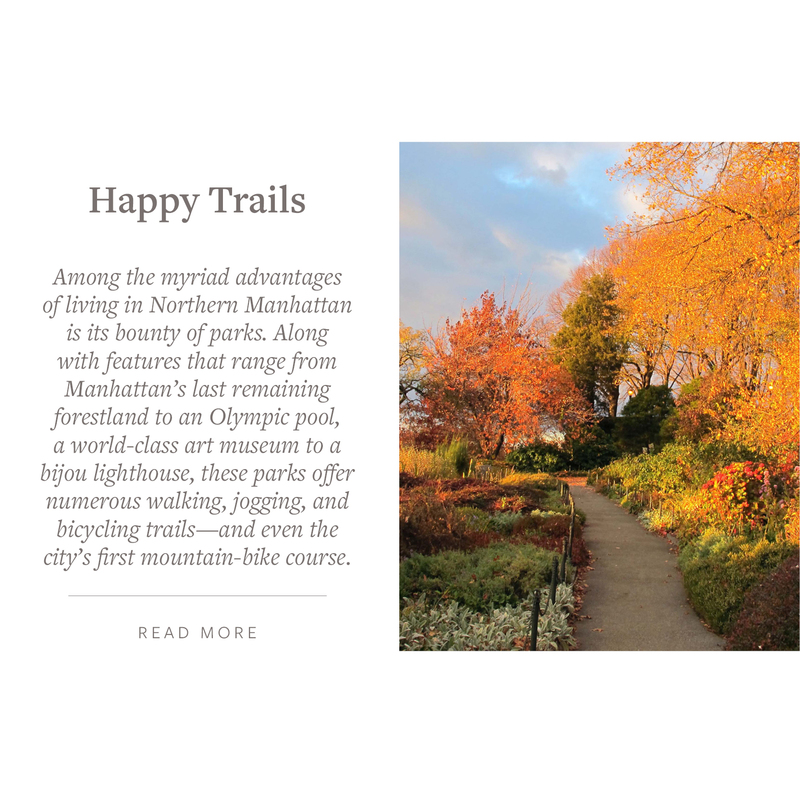 The highest ground in Manhattan displays majestic bluffs and hills of Upper Manhattan offering spectacular vistas. The earliest known Lanape tribes used the area for hunting, fishing, farming and trading followed by the Revolutionary War era. 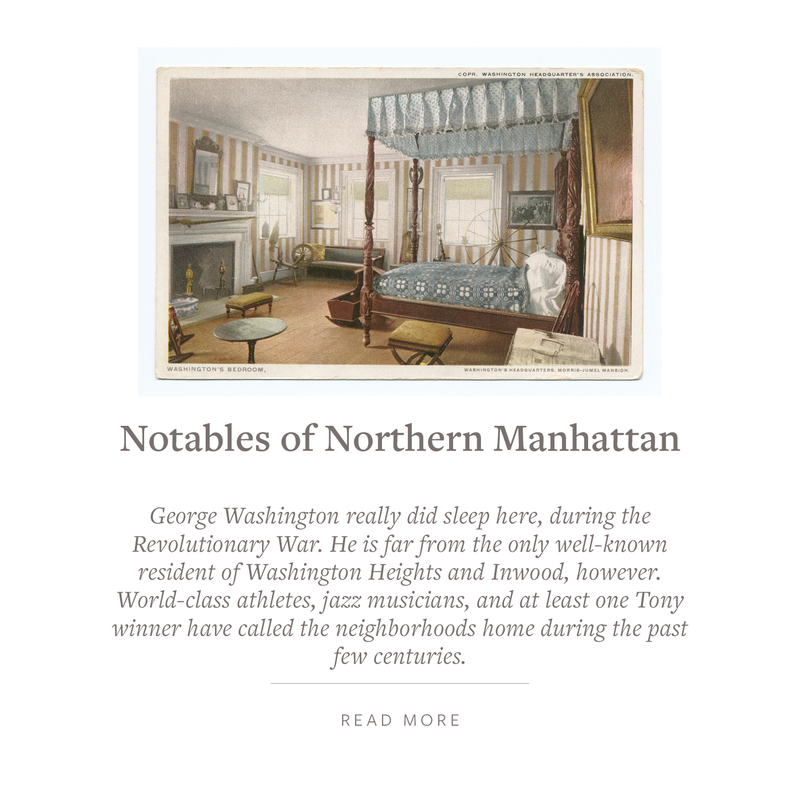 Upper Manhattan continued to be a rural farm community sprinkled with country estates until the 19th century when the German, Finns, Scotch and Irish arrived an at the turn of the century the Italians arrived. The 30’s and 40’s brought the German Jewish community and now the area is represented by a wide array of ethnicities and cultures, like Cuban, Dominican, and Puerto Rican. And, in small numbers the newest group are Ecuadoran, Mexican, Russian, Serbian and Syrian immigrants. 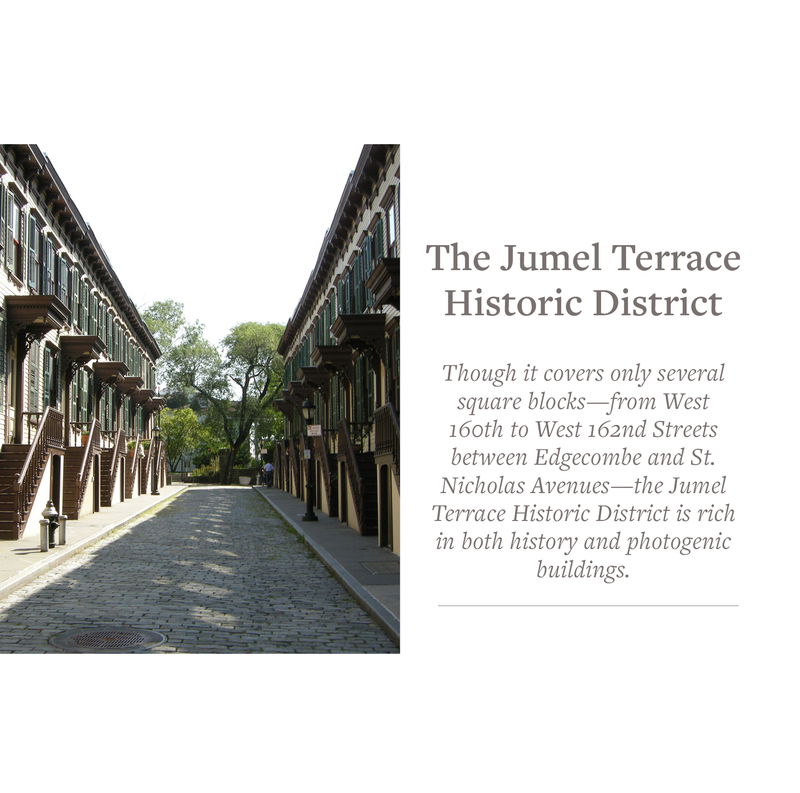 Forgotten New York explores the rich history of the area and buildings that remain in their two part article: Hitting the Heights Part I and Hamilton to Washington Heights Part II . Lin-Manuel Miranda an American composer, lyricist, playwright, and actor grew-up in Inwood and received an honorary degree from Yeshiva University in Washington Heights. 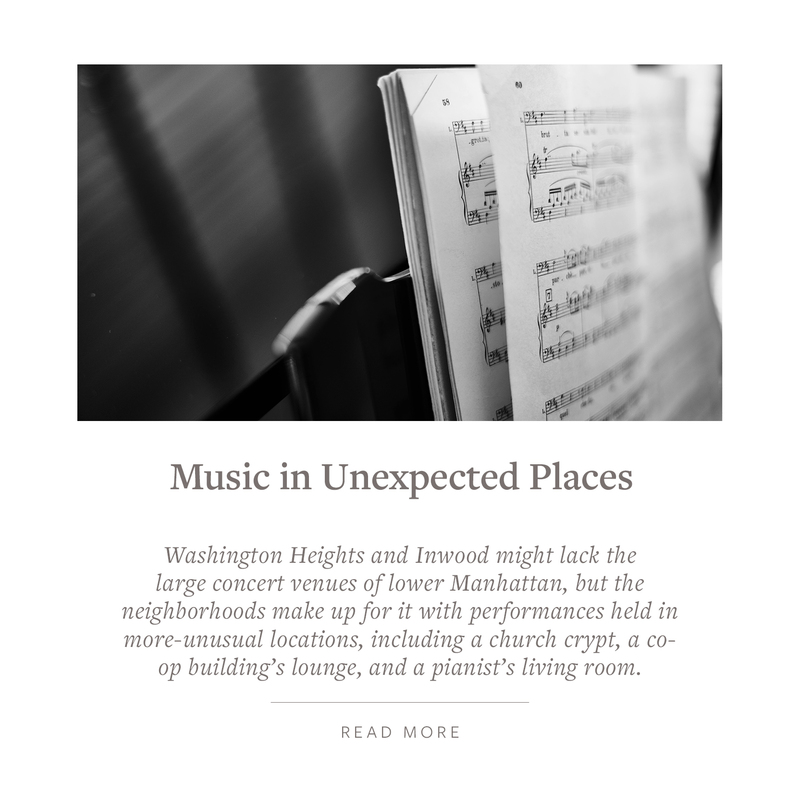 He is best known for creating two Broadway musicals Hamilton and In The Heights that are a nod towards his roots; the Upper Manhattan neighborhoods of Hamilton and Washington Heights Inwood. 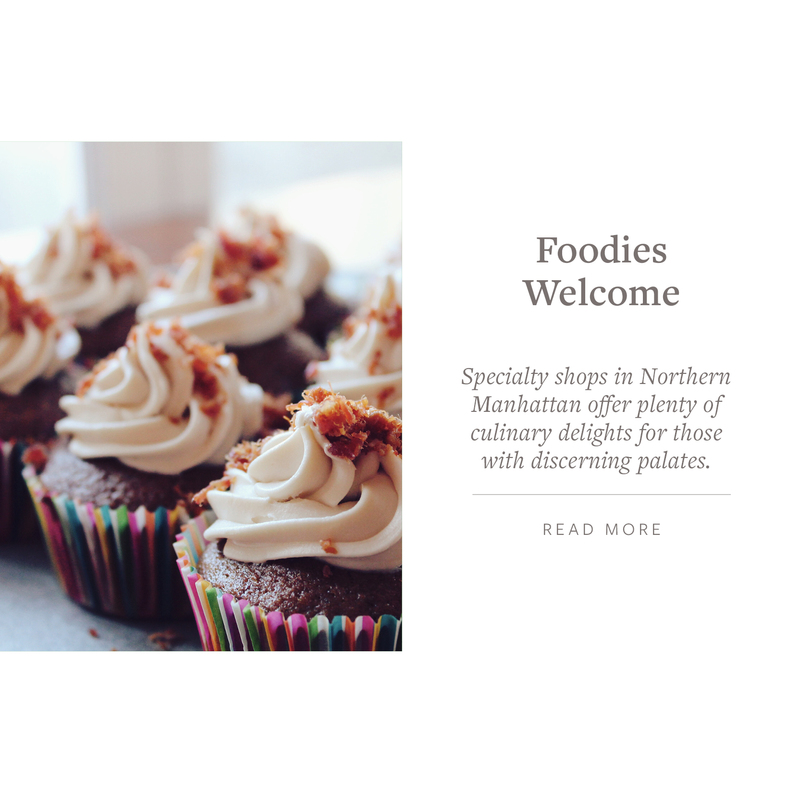 There is a rich artistic community in Upper Manhattan and the Northern Manhattan Arts Alliance (NoMAA), a non-profit organization supports and cultivates the works of artists in the area and organizes exhibitions throughout the year. Currently the New Bench, works by Suprina, Sam Holleran and Hugh Hayden examines the bench as a social construct on view through February 2018 at the Norther end of Inwood Hill Park (enter at Indian Road and 218th Street). 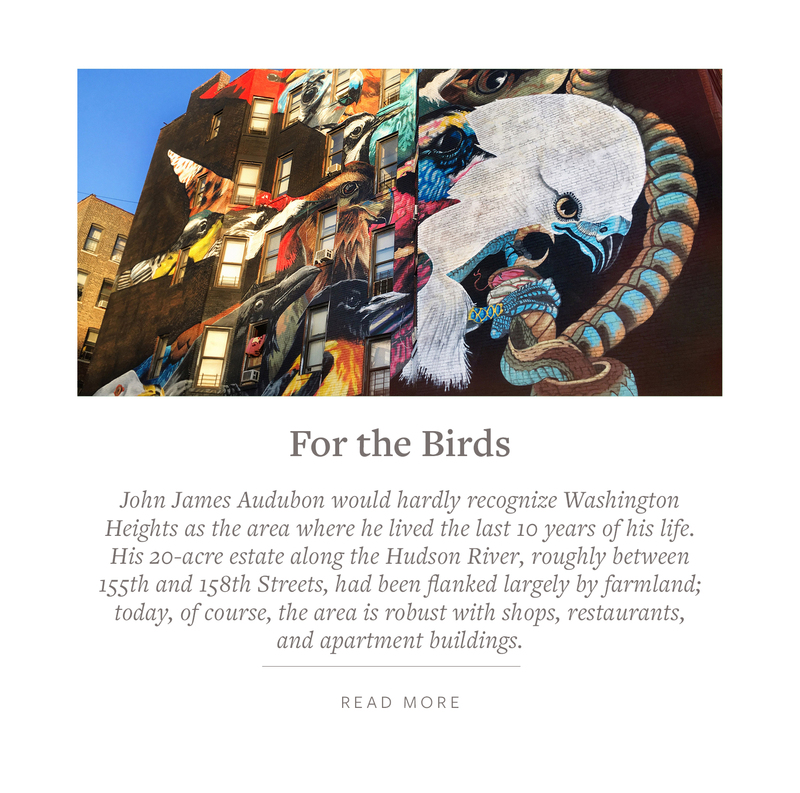 The Inwood Film Festival March 15th – 17th celebrates and showcases the Inwood community through the moving image, presenting films made in the neighborhood or by Inwood-based filmmakers. The United Palace of Cultural Arts originally opened as the Loew’s 17th Street Theatre in 1930 as a vaudeville house and deluxe movie theater and is now and arts and cultural center offering movies, dance performance, concerts and children events. Check out their calendar for upcoming programs and events. The Up Theater Company produces professional theater to the community and develops new plays. Currently at Fort Washington Collegiate Church W. 181st Street & Fort Washington Avenue they are showcasing their Dead of Winter Series – 4 Cold Sundays – 4 Hot Plays. Besides the restaurants highlighted in this month’s Culturally Inclined the La Marina Restaurant, bar and event space offers fine dining with “stunning river views-a true out of City Experience” at 348 Dyckman Street and the New Leaf “tucked away in Fort Tryon Park is a perfect spot for an event or a modern American meal inspired by local markets and nearby farms after visiting the picturesque Cloisters museum and gardens. The start of new things awaits us. Reach out to me to catch-up or if I can be of service to anyone in your network with their real estate questions or situations. Embrace change to construct the joyful life you desire. Wishing you a transformative new year.